Since 9/11, policymakers, pundits, and presidents have told us that spreading freedom abroad will solve fundamentally religious problems such as terrorism and the oppression of religious minorities. In their accounts, religion is a divisive force that serves as a disguise or rationale for violent ambitions. Simultaneously, they portray religion as a pacifying force, suggesting that its inherent altruism lays the groundwork for reconciliation. This paradoxical quality of the contemporary geopolitics of religious freedom is a prominent facet of the ongoing War on Terror, but it has a long history that predates 9/11. 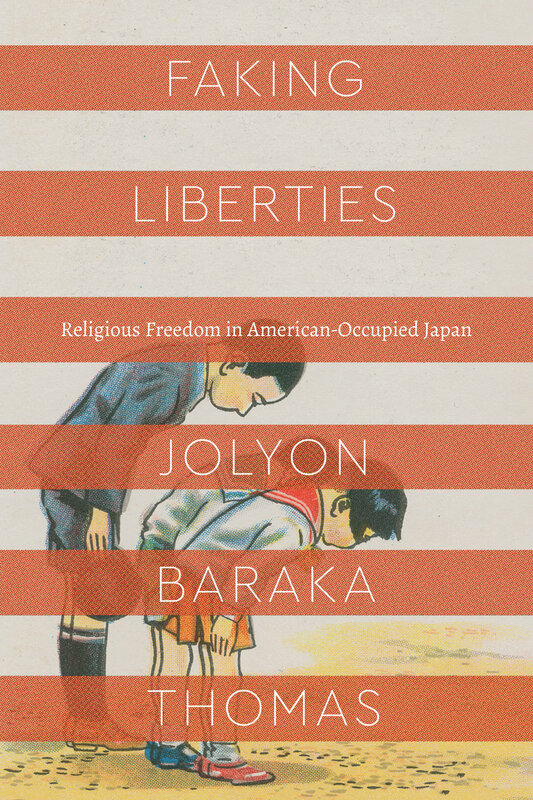 Faking Liberties: Religious Freedom in American-Occupied Japan returns to the close of World War II, examining the Allied Occupation of Japan (1945–1952) as an historical case of the United States and its allies attempting to spread religious freedom abroad. The occupiers presented religious freedom as a corrective for Japan’s “bad religion” of State Shinto, claiming that Japan’s prewar constitutional guarantee of religious freedom was a farce. Occupation policymakers argued that Japanese politicians had cynically abused religious ideas for militarist ends, and they suggested that Japanese religious leaders were either ignorant of the importance of religious freedom or complicit in the construction of illiberal policies and legislation. The Americans took it upon themselves to reorient the Japanese people by eradicating ultranationalist ideas from public life and by instilling a “desire for religious freedom” in the Japanese populace. By the time the Occupation ended in May 1952, they declared their mission accomplished. This triumphalist story about the successful promotion of religious freedom during the Allied Occupation has been virtually unquestioned for decades. Upon investigation, however, the received narrative about Japan’s twisted relationship with religious freedom turns out to be false. In fact, a robust conversation about how to define religion and how to free it characterized the entirety of the time when Japan’s first modern constitution was in effect (1890–1945). Clerics, lay religious leaders, legislators, policymakers, and scholars of religion all weighed in on what religion was and how to protect it. They used the inherently democratic processes of protest and parliamentary procedure to do so. To be clear, the occupiers were not wrong in describing the prewar constitutional regime as repressive. Police stamped religious groups out of existence and charismatic religious leaders died in prison. However, the prewar and wartime regime was repressive because it was secularist, not because it was dominated by Shinto as a state religion. It was the discrimination between “religion” and “not-religion” that allowed the Japanese state to so thoroughly and devastatingly police religious practices, not cynical political manipulation of Shinto doctrine. Across the Pacific, the same conceptual distinction allowed American majorities to designate Japanese and other religious minorities as un-American and worthy of exclusion or expulsion. In both Japan and the United States, political authorities and clerics selectively applied religious freedom so that it was capacious enough to match their interests but circumscribed enough to exclude groups and practices they deemed unsuited to the national character. When the Occupation began in September 1945, the occupiers claimed to be introducing an antidote to State Shinto that they thought of as “genuine religious freedom.” However, their practices of governing religion were strikingly similar to the administrative practices of the prewar and wartime regime. Bureaucrats enacted policy based on their informal hunches about what constituted “real religion.” Scholars of religion told religious people how to behave—and even what to believe—in the name of religious freedom. Trans-denominational organizations aligned themselves with political authority, while bureaucrats used those same trans- denominational groups to gather intelligence and disseminate policy prescriptions. These continuities between the prewar and wartime Japanese regime and the American military government suggest that Japan was never the exception to the global rule of religious freedom. Japan did not “get religious freedom wrong” in its 1889 constitution, nor were Japanese religious leaders ignorant of the importance of religious freedom. Rather, Japan exemplified the normal functioning of secularist governance, which defines and constrains religion in order to free it. To make this claim is not to apologize for the repressive aspects of the wartime Japanese state, but rather to use the case of Japan to show that all guarantees of religious freedom are shot through with inconsistency. In other words, religious freedom is not a timeless and universal “principle” that some states distort. Rather, a universal characteristic of constitutional guarantees of religious freedom is that the parties who craft and interpret them always make distinctions between “religion” and “not-religion” in ways that privilege some interest groups over others. I make this broad theoretical claim about religious freedom to challenge received narratives that the prewar and wartime Japanese state paid lip service to religious freedom while denying it in practice. However, it is true that significant changes regarding the interpretation of religious freedom were introduced during the Occupation. In a unique transnational context where the American military government dictated policy while the local Japanese government enacted it, religious freedom could no longer be a mere privilege granted to citizens by their states. It could not just be a “civil right” guaranteed in the constitution that the occupiers magnanimously (superciliously, condescendingly) bestowed upon the Japanese people. Religious freedom had to become something more. It had to become innate. It needed to become timeless and universal. In short, religious freedom had to become a human right. Like all human rights, the new human right of religious freedom faced a problem of enforcement. It was premised on the idea of a universal religiosity intrinsic to all humans, but what that religiosity looked like and whose religion actually counted remained a vexing problem. Expansive rhetoric to the contrary, in the late 1940s the language of religious-freedom-as- human-right bumped up against the need to police Japanese political leaders for signs of militarist recidivism. The conundrum appeared in Japanese electoral politics as trans- denominational organizations regarded marginal religions’ rapid numerical growth with consternation. It featured in postwar reflections on war responsibility in the common idea that “real religion” would have opposed political authority during the war. These narratives were constructed in part by religious organizations and Occupation bureaucrats, but scholars of religion played a major role in making determinations about what sort of religion deserved protection. Their discussions of State Shinto, Buddhist war responsibility, and the need to surveil or protect new religious movements reverberate in contemporary global conversations about how to govern religion. Their voices echo in American policymakers’ talk about liberating religion. The takeaway message of this book is that some stakeholders—clerics, policymakers, journalists, government functionaries, and scholars of religion—have vested interests in portraying political ideals or violent acts as reducible to false religious ideology. Others will claim the mantle of religious freedom in order to advance parochial missionary projects. Still others will make normative claims about “real religion” being altruistic, apolitical, and austere as a way of reducing the potentially subversive qualities of religion. All of these parties make religion in order to free it. None of their constructions should be unquestioningly trusted.